Next UP!!! GearJam Vintage Drags & Swap Meet!!! is Saturday & Sunday, May 11th & 12th at the Atlanta Dragway in Commerce, GA. Priority Vendor Gate: 6-7am, $30 for all the space you want. Vendor General Admission: 7am, $20 for all the space you want. Everybody driving vintage or modified truck into the Cruise-In this month, receives a $10 Eckler’s Gift Certificate! The weather is supposed to be great—you’ll kick yourself if you don’t come out Saturday morning! 4-speed, Heads-up Gasser group; Southern Slingshots Front Engine Dragsters group; South East Nostalgia Dragsters Group; Outlaw Gassers… they’ll all be there, along with hot rods, muscle cars and Nostalgia Super Stocks! Two-day swap meet—spaces still as big as you want! 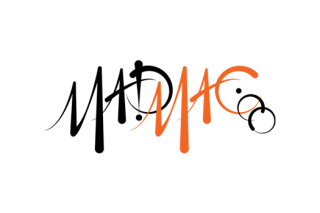 Midway for manufacturers and specialty vendors—clothing, art, etc. We’ve still got spaces available on the midway, so give me a call to reserve yours. Car show open to all makes, models and years, with every entrant getting a $10 Eckler’s Gift Certificate. Car show entrants can make Test and Tune passes on the drag strip throughout the day, after passing tech inspection. $5 of every show car entry goes to the Georgia Street Rod Association, to help their efforts down at the state capital on our behalf. The show has grown every year, and we’re expecting this year’s to be the best yet! Tell your friends, and make plans to be there! Pedal To The Metal Was a Big Success! No surprise—last month’s Pedal To The Metal spring feature at the swap meet continues to be popular. What is a surprise is how far some vendors travel to be here! We had guys from Alabama, Florida, Tennessee and the Carolinas. The momentum for these shows is starting to build, and we’re already expecting a good turn-out for the October installment. Mark your calendars. The guys will be stripping a ‘50s Rolls Royce down to its bare essentials, which is a project a Rolls owner isn’t going to just trust to anybody. After the Rolls rolls on, the guys will be rolling in a 40-foot RV with under-frame storage boxes that are rusted from it’s former life in Yankee Land. They’ll be blasting some of the frame, too. With the Atlantic crossed, and Yankee Land represented, the Pacific logged in with several sets of motorcycle wheels being blasted in preparation for powder coating. A ‘50s John Deer tractor is fresh off the farm, while one of its country neighbors shipped up a ’57 Chevy that must have been sitting in a barn forever because Lanny said it’s one of the most rust-free ‘57s he’s seen. 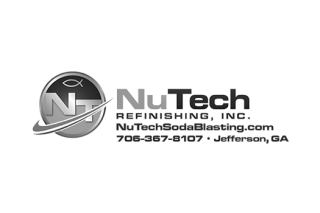 Sometimes we want to go to NuTech just to see the cool nekkid stuff they’ve got laying around! Still seeing enthusiast vehicles in the parking lot! If you drive an enthusiast vehicle to the swap meet, DON’T PARK IT OUTSIDE THE FENCE!!! There’s no additional charge to bring it in and park it in the Cruise-in area. And speaking of The Cruise In area… it seems to have gotten kinda raggitty, with people parking on the wrong side of the snack shack. I’d take it kindly if you could make an effort to park everything cool along the grand stands—it makes that part of the event look bigger, and is actually a draw in itself for the summer: people call me every month and ask about the Cruise-in, and they actually DO come just to see the hot rods, so we need them parked all together. Springtime is in full swing at JP’s! They’re putting the finishing touches on a ’68 RS Camaro convertible, powered by a 383 with FITech Fuel Injection backed by a 7004R; AC, power windows and top, 4-wheel disc brakes and more upgrades. They decided to do a frame-off on the ’71 Blazer: Chassis is built with disc brakes at all four corners, new Eaton Detroit springs, stainless lines and a Tanks Inc. fuel tank and system, Hydraboost power brake system… As they get further into it, upgrades will include a Retro Sound radio, Classis Auto Air, Dakota Digital with Cruise Control, Newport wipers, Concept One kit front runner kit for the engine, LED lighting and more. They calendar for the hot rod shop is filling quick-like for the summer, and they can fit in smaller jobs if you’ve got something that absolutely needs to be done to make a show. They’re also still selling parts, and if you need anything, swing by the trailer and talk to Johnny about placing an order and picking it up at the next show—they’re delivering several big items this Saturday, saving their customers a bundle in shipping. 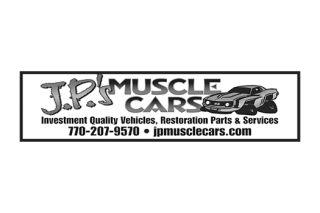 JP’s Muscle Cars is at 113 Hammond Drive in Monroe, GA: Call (770) 207-9570 or visit their website at www.jpmusclecars.com. What are you working on this month, Rob? “Race car!” Rob is thrashing on the recreation of his dad’s ’33 Willys gasser (of course it’s powered by a 409!) getting it ready for the first race of the season and then displaying it down at Summit’s Atlanta Autorama next to my nostalgia Altered that I’m also thrashing on to get it ready for the show. This month they also finished some high-end restoration work on a 1-owner ‘62 Corvette—correct engine build, suspension, brakes, and transmission. Engine builds that went together were a 383 Chevy, all-aluminum 477 big block for a gasser, and a whole bunch of machine work on blocks and heads prepping for other builds. In between all of that they restored a ’69 Firebird aluminum intake, and uncoated then repaired an SLP Tuned Port replacement intake. If you’ve got aluminum pieces that need to be restored, concours Chevy restoration work, or an engine build from stock to off-shore racing boats and everything in between, take it to Lamar Walden Automotive. Lots of great discussion on the radio this month with Bud’s Garage! The SK Battery Plant in Commerce is probably one of the biggest Automotive-related things to hit the state of Geandorgia in a decade. They’ve got tons of Mopar news to report, and will be discussing New Car Conveniences (the good, the bad and the downright mean… which has us completely intrigued! ), and will be talking with the new head of Lanier Tech’s Motorsports program. Apparently pro driver Randy Probst fell victim to electronic controls while track testing, and we’ll get the details. Finally, they’ll be giving tips on driving your street car on a race track, talking about the swap meet, the Gear Jam, and the YearOne Podcasts. Automotive Buffoonery every Saturday, presented by The Slack Auto Parts Company! My friend Chuck Keene has closed his Georgia Hot Rods shop, and will be having an auction Saturday, April 13 at the shop, and everything goes! He’s got a ton of parts (including Superformance Cobra parts), tools, shop equipment (including a 4-foot sheer, welders, air compressors, etc. etc. ), signs, books and literature, an LS-powered ’32 roadster, and more. 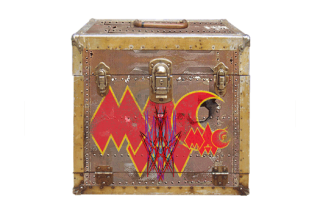 There’s a whole bunch of cool stuff there I don’t need, but will probably find its way into my shop nonetheless. 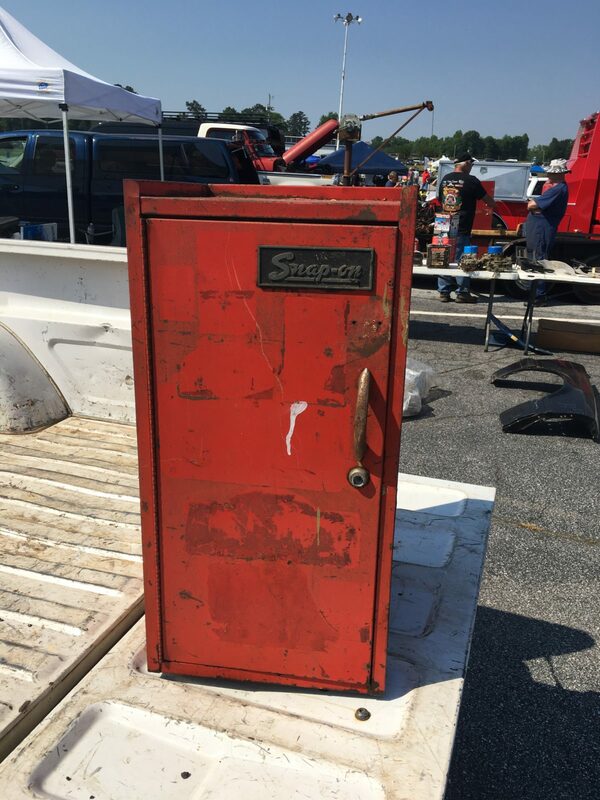 The auction starts at 10am, and is located in Jefferson, GA.
I’m putting the word out now that August is going to feature Trucks at the NE GA Swap Meet. I’ve contacted a couple FaceBook truck groups and extended an invitation to them, and will be contacting more, plus other clubs—all makes. Clubs will get in free as vendors and spectators (contact me for details), and will each get a $10 Eckler’s gift certificate. If you’ve got truck parts, make a point of being there in August! 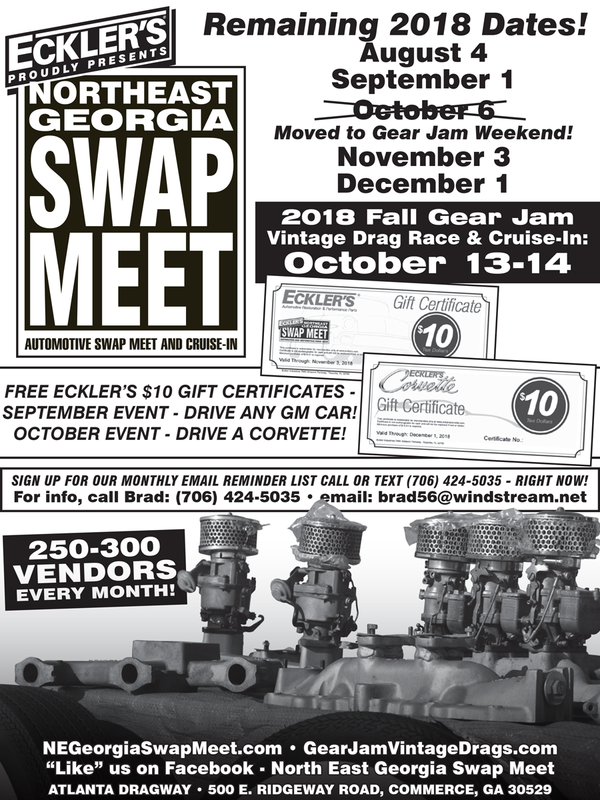 If you’re a member of a club—Trucks or any other car club—and would like to use the NE GA Swap Meet as a club event, call me and we’ll schedule a month for you to let your club in free as vendors and spectators, and will hook you all up with an Eckler’s gift certificate. The Eckler’s NE GA Swap Meet is this Saturday, March 30 “This IS the April Show” at the Atlanta Dragway in Commerce, GA. The Eckler’s NE GA Swap Meet is this Saturday, March 30, this is the April Show, Due to Event Scheduling at the Atlanta Dragway in Commerce, GA.
Everybody driving a Ford or Mercury product into the Cruise-In this month, receives a $10 Eckler’s Gift Certificate! The weather is supposed to be great!! In 15 years of relying on weather reports, I’ve found weather.com to be the most accurate. They’re calling for only a 20-percent chance both Friday and Saturday (so there shouldn’t be a weather pattern coming that speeds up or slows down to land on Saturday), and a high of nearly 70 degrees. Keep tabs on it yourself: Commerce, GA 30529. I’m Expecting a GREAT Turn-Out! Our March swap meet is typically one of the bigger ones of the year, and going into a swap meet I’m always able to gauge the turnout by how much my phone rings the week before the show. This whole month, I’ve taken calls nearly every day. I don’t remember that EVER happening. And it wasn’t just from people who know about the show and were looking for information—most of them were first-time callers who’d never been to the show. People told me they’d heard about it from friends and family and had never come, they heard about it at other shows (including a vintage tractor show), they’ve heard about it for years and haven’t been and are going to this weekend, or they found my website or saw it on Facebook. I will not be surprised to see 300 vendors set up this weekend—especially with such good weather predicted! This is the year we become Giant Killers. I said a couple months ago I think this year is the one that’ll break us out. And I believe that more than ever after fielding calls all month. So please, do your part, and make it a priority to get to the Eckler’s NE GA Swap Meet every single month this year—If you do, we’ll start knocking down 400+ vendors per month (and we CAN, easily, if everybody just makes an effort to show up EVERY month! ), then it’s going to be a runaway diesel—there’ll be no stopping it. Just imagine: a monthly swap meet in the SE that has 400 vendors every month. When that happens, it won’t be any time until vendors and spectators are coming from Nashville and Birmingham and Orlando every single month, because THEY’LL HAVE TO! And then we’ll hit the 500 vendor mark shortly after. And so it’ll go. But it won’t happen if YOU don’t come every month. Does it sound optimistic? Of course. But does it sound POSSIBLE? Absolutely: We’ve got just shy of 8,000 people getting this newsletter. If all of you make a point of coming to the swap meet every month, well… you know. It can’t help but happen. The last two shows were light due to weather, but just a couple years ago we didn’t even have shows in December, January and February because they lost too much money. Now even those shows have more vendors than our best shows 5 years ago. And as for the hours? With that many vendors on the show field, the hours will go longer. As it is now, the vendors go home when the spectators go home. Pump 10,000 spectators into the facility to look at 400 or more vendors, and it’s simple timing: it’ll take everyone longer to go through it, so the spectators will stay, which means the vendors will stay, and then there you are—that, too, is a self-feeding machine. So please make the effort to come to EVERY swap meet this year. Bring your friends, bring your kids, bring your dog. Just come! Don’t do it for me, and don’t even do it for you: Do it for the strength of our hobby. Do it for the Car Guy Economy. The bigger this show is, the stronger our hobby is in the South East, and that’s good for all of us. March and October we feature the Pedal to the Metal vintage bike area at the swap meet, and it’s always a big hit. I’m always surprised at how far away bike vendors come from: I’ve heard from vendors in the Carolinas, Florida, Tennessee and Alabama, many of them staying in local hotels on Friday night for the show on Saturday. If you’ve got some vintage bike stuff kicking around your shop and want to get rid of it, or you’ve been looking for one (like I did a couple years ago), make sure to hit this swap meet! Talked to Lanny Porter at New Tech the other day… and as I type this, I realize that I probably spell his name every way possible in these news letters… Lanny, Lannie, Lanney… I think the only way I haven’t typed it is Laknee. Anyway, his health is on the mend, and there’s a chance he’ll be at the swap meet this Saturday talking blasting. Apparently a bunch of bypass surgery takes the wind out of your sails. BUT, if not, you can certainly give him a call, because he said the last few weeks he’s been chained to his desk doing paperwork and answering calls. Bring your parts up to him, and the guys will unload and strip them for you. This month they stripped a Studebaker Avanti body, which I did not know was fiberglass! They also stripped a truck frame, another customer brought in a ’54 Chevy truck cab, while the one that I found most interesting was a 30,000-mile LeMans body that’s undergoing a full resto. They also did some huge Estate Gates for the front of someone’s driveway, and “More lawn furniture! We do a lot of lawn furniture these days…” I have to be careful, or I’m gonna be on the lookout for grandma’s glider! Give them a call to see about dropping parts off with them at the show, and if they’re not going to be there but you don’t want to make the trip back to Jefferson, leave them with me and I’ll drop them off. I’ve done it a few times, and don’t mind. My buddy’s daughter will be selling Girl Scout cookies this month next to the Eckler’s Tent. Keep it in mind if you need your annual fix. April’s Swap Meet is MARCH 30! Conflict with the track for the April show… same thing happened last year, worked out fine, not a big deal. But be sure to mark your calendar, because I hate getting calls from guys at 7am on the wrong day asking why I’m not at the track! Well, Johnny busted out of town before I could find out what he’s been working on at this place, but was told by his fill-in crew that they’ve been non-stop busy installing AC systems, doing chassis and suspension upgrades, wiring installations, and even full restorations on customers cars for the last month. They’ve also got a list of take-out motors and transmisisons from different GMs, from LS to 283 Chevy. The Cruising Season is nearly upon us, so if you’ve been putting off anything, give them a call to get yourself a schedule time to do that upgrade before the sunny weather gets here. Oh yeah, he’s also selling reproduction parts, and is delivering some sheet metal to customers at the swap meet this Saturday, saving them a bundle in shipping. This month, the guys at Lamar Walden Automotive built a few 409s, a couple big block Chevy engines, refreshed a Duramax pull-truck engine, heads-and-cam on a new Corvette, built an aluminum 509-cubic inch 409, and got some unique work in, in the form of a power steering conversion on a ’61 Ford Skyliner, while besides the usual intake manifolds and such for their aluminum restoration process, they got a valve cover for a ’71 Datsun 240 Z to restore! Besides all that, Rob is working on his 4-speed/409-powered ’33 Willys gasser, planning to have it done by the SEGA season-opener and then ready to display next to my Altered at the Atlanta Autorama, a couple weeks before the Gear Jam Vintage Drags. If you’ve got engines that need building, transmissions that need swapping, suspensions that need upgrading, or aluminum parts that need concours restoring, you need to call Rob at Lamar Walden Automotive. I’ve got the nicest ’71-’72 Cutlass hood you’ve ever seen, in my trailer. It’s the plain hood, not the one with the grills or the scoop. If you’re looking for one, or have a friend who needs one, be sure to come to my trailer next to the Eckler’s tent, or call me at (706) 424-5035. Items of interest in upcoming shows include Motor Trend’s Randy Pobst talking about the best cars, vest SUVs coming down the road from the manufacturers, External Air Bags on cars. Guest talk with a crew member from Dayton 500 winner Danny Hamlin—who is an alum of Lanier Tech! Not only is Lanier Tech a fantastic program for MotorSports Development that has placed many, many students with professional race teams, but Bud Hughs was instrumental in getting the program off the ground. His former student will be visiting and talking about it and his career with the Daytona 500 winner. The old Miami Vise TV series boat is up for auction… and it comes with a $1 dollar Ferrari! They were C3 Corvettes with fiberglass Ferrari bodies, obviously not the real thing… but it’d be kinda cool to have one of them, wouldn’t it? Keep the boat, though… I have enough money pits. New Rolls Royce SUV… only $330 Grand. A bargain at twice the price! My friend Chuck Keene has closed his Georgia Hot Rods shop, and will be having an auction Saturday, April 13 at the shop, and everything goes! He’s got a ton of parts (including Superformance Cobra parts), tools, shop equipment (including a 4-foot sheer, welders, air compressors, etc. etc. ), signs, books and literature, an LS-powered ’32 roadster, and more. Club Days—Free Entry, and a Eckler’s Gift Certificate for every member! If you’re a member of a car club, and would like to use the NE GA Swap Meet as a club event, call me up and we’ll schedule a day to let your club in free as vendors and spectators. Not only will that stop the side-seat driving, but it usually ensures no interruptions of the ball game on the radio for the next several miles! Copyright © 2019, Driven Events, All rights reserved. ALL RIGHT!!! The weather looks like it’s gonna cooperate AGAIN, February 2nd for the NE GA Swap Meet! Hot Dog the weather looks like it’s gonna cooperate this Saturday, January 5 for the NE GA Swap Meet! Eckler’s presents the Northeast Georgia Swap Meet Saturday, January 5th at the Atlanta Dragway in Commerce, GA. This is a great place to find your Automotive, Motorcycle and Vintage Bicycle Treasure!